© NCJ Graphics Close to the Earth’s surface, the paths of a stone and ray of light appear to follow different degrees of curvature (Diagram 1). In spacetime (Diagram 2), they are seen to follow the same degree of curvature. You throw a stone up, it comes back down. How does it know to do so, absent little arrows in the air? Isaac Newton and Albert Einstein offered two very different answers, neither of which is easy to visualize. In Newton's version, two masses, the Earth and stone, are attracted to each other by the force of gravity, like an invisible rubber band (except the farther away the masses are from each other, the weaker, not stronger, the attraction). Newton himself knew his theory was no more than a mathematical convenience, writing, "That gravity should be innate, inherent, and essential to matter, so that one body may act upon another, at a distance through a vacuum ... is to me ... an absurdity." Einstein replaced Newton's "absurdity" with what might, at first blush, sound equally absurd: freely moving bodies, including light, moving in straight lines through "curved space." Diagram 1 shows the paths taken by a stone and a ray of light from A to B close to Earth's surface. Both are curved, but they're obviously very different. While the stone follows an arc, in this case 1.2 meters (about 4 feet) high, the light ray also follows a path, but one that deviates from a straight line by the merest fraction. So how can we possibly say they're following the same path? By taking note of the time difference: The stone takes one second to go from A to B, while light goes the same distance in a tiny fraction of a second. Einstein employed the trick of measuring "seconds of time" in terms of "meters of distance" by multiplying "t" seconds by the constant "c", the speed of light, 300,000,000 meters per second. One second is then represented by 3x108 meters (i.e. 1 second x 3x108 meters/second). So now we can create a truncated 3D representation of what's going on, with two dimensions of space and one of time-as-distance, Diagram 2. (It's truncated because the third spacial dimension isn't shown.) 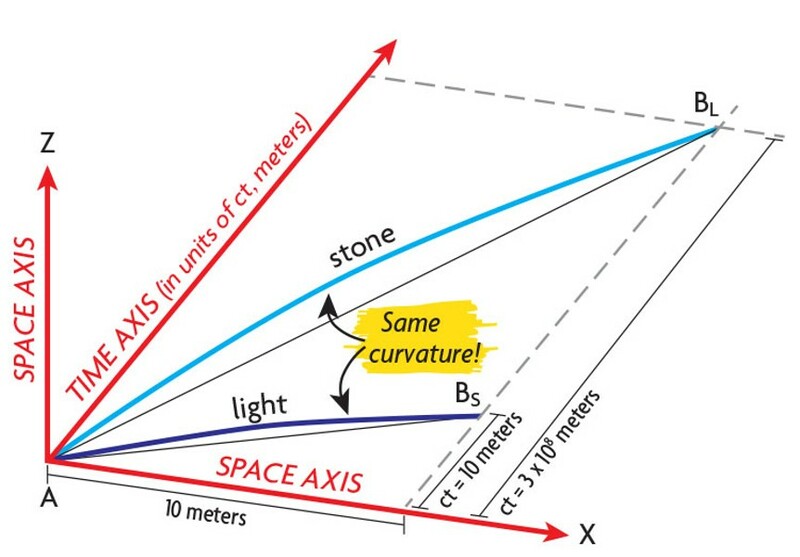 Here, the stone and light ray do exactly what they did in Diagram 1, but now we've added time axis y (going into the paper) to create a "spacetime" picture. In spacetime, stone and light start at point A, but (unlike in Diagram 1) they end up at very different points, BS and BL. While the ray of light travel time is just 10 meters (in our time-to-distance conversion -- it's really 3 x 10-8 seconds), the stone takes much longer, 3 x 108 meters (really 1 second). Here's the kicker: The two paths, stone and light, have the same degree of curvature! What curvature? That caused by the mass of the Earth. Instead of some mysterious Newtonian force, Einstein's gravity is defined geometrically as curvature in which bodies "fall" along the shortest possible paths (geodesics). So, is gravity really a force of attraction (per Newton) or is it really curvature in spacetime (per Einstein)? Who knows? True, curvature explains why massless light, as well as massive bodies, travel along geodesics ("thinking" they're going in straight lines). In this sense, conceptualizing gravity as spacetime curvature gives more accurate results than Newton's invisible force. But so long as we're stuck in our 3D bodies trying to picture 4D spacetime, we're stuck in the land of metaphor, which isn't a bad place to be, but it would sure be nice to actually see what Einstein was trying to tell us. Barry Evans (barryevans9@yahoo.com) owes a profound debt to Dr. Paul Boynton of Washington State University for introducing him to these ideas, circa 1980. 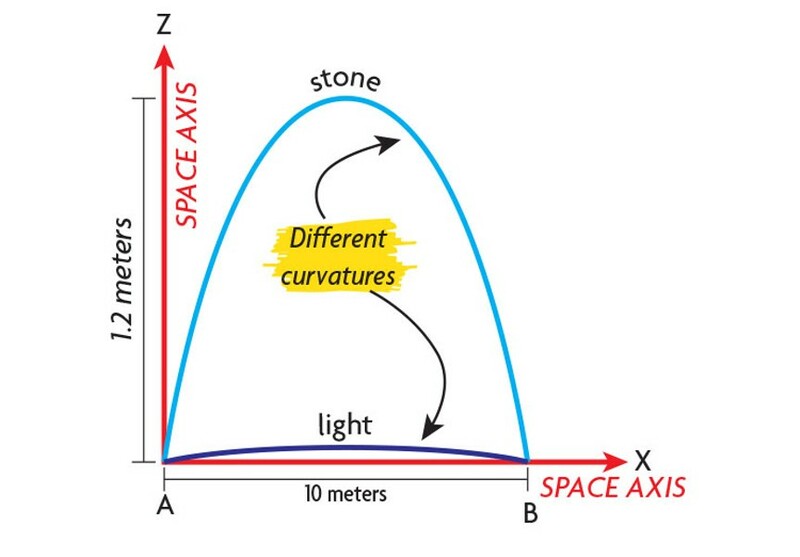 CAPTION: Close to the Earth's surface, the paths of a stone and ray of light appear to follow different degrees of curvature (Diagram 1). In spacetime (Diagram 2), they are seen to follow the same degree of curvature.